So, you've decided to take a crack at Summoning? Whether you're after a Minotaur to fight alongside you in battle, a Beaver to help you in your Woodcutting needs, or a Yak to carry your valuable items, Summoning is the skill for you. The following guide will hopefully make it a little easier for you to make sense of this wild skill. Requirements: This is a member's only skill. Although once you must have completed the Wolf Whistle quest, the quest is no longer a requirement to start the skill. 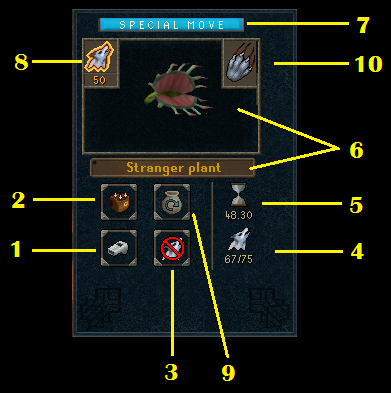 Note: During this guide, when it is said you need something to "Summon a creature," it actually costs nothing other than Summoning points (explained below) to bring a creature into the world of RuneScape. The materials are used to create Pouches which contain the 'essence' of the creature, and these Pouches are used to do the actual Summoning. Think of it like making a cocktail with all the ingredients, and then pouring it out when you want to. A Menagerie is a room for your Player-owned house made by using the Construction skill. 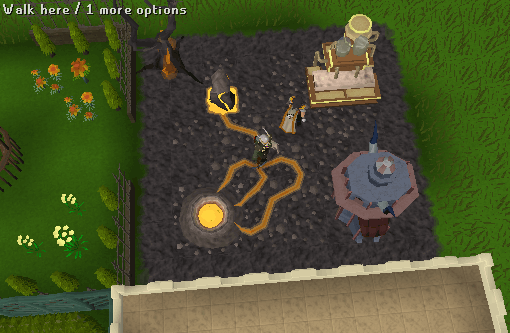 Level 37 Construction is required, and building the room costs 30,000gp. In here, you can recharge your summoning points, store and feed your pets, or just enjoy the scenery! Just remember that to add a pet, it must be fully grown. Any type of pet can be kept here, except for Fish and Clockwork cats. This is the easiest to access, as it is where you begin the quest, and is in a safe region. Simply enter Druid Pikkupstix' house and climb through the trap door. Pikkupstix also runs a shop. For those that have completed the Underground Pass will be able to access this Obelisk, located in the tunnel towards the end of Pass. 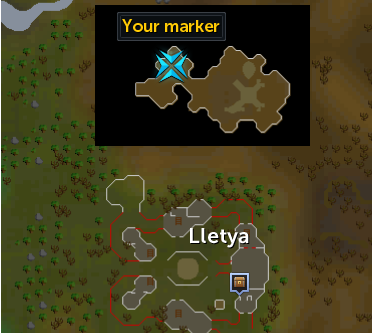 You can get to it more easily by teleporting to Lletya using a Teleportation Crystal and walking to the cave entrance highlighted on the map. However, there is no shop at this location. The Obelisk on Karamja is located on the peninsula on the north-western tip of the island, near Brimhaven. It is just South of the gold mining spot used in the Heroes' Quest. There are a few scorpions nearby, but plenty of plants to hide behind if you get in trouble! Unfortunately, there is no shop at this location. 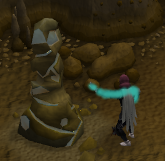 This Obelisk is located in Filliman's Grotto, which can be accessed during and after the Nature Spirit quest. There is also a Wishing Well, which is actually a shop. 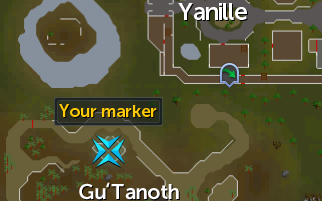 Gu'Tanoth is located to the south of Yanille, and luckily, you don't need to complete any quests to use the Obelisk and shop. Bogrog also exchanges your pouches for spirit shards. This is found just south-west of Pollnivneach, across the bridge, to the west and down a ladder. Another way to get there is to travel to Nardah, where there is a bank, via Magic Carpet and walk east until you reach the ladder. Due to it being in the middle of the desert, there is no shop to be found. Be sure to bring your Standard Desert Traveling Gear (Desert Robes or Graahk Armour, Waterskins and a knife), and watch out for the level 63 Crocodiles! The Piscatoris Obelisk is located just South of the Fishing Colony, down a trapdoor. Although it is surrounded by crates, there is no store at this location. 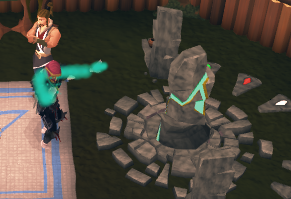 There are some places in RuneScape where you cannot Summon a creature, or take one in with you (usually Pets are allowed). 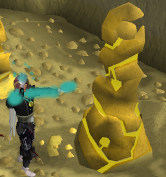 These include places such as the Grand Exchange, the Mage Training Arena and some of the other Activities. However, there are other areas (near Obelisks where you can infuse Pouches) where you still cannot Summon creatures, but you can take Familiars in with you. A Pouch, which can be bought from any of the Summoning stores for 1gp each. They are stackable. Several Spirit Shards (depending on what you are Summoning), which can also be bought from any store, but for the price of 25gp each. These are also stackable. A Charm, of which you would need a different color depending on what Pouch you are making. There are two groups of Charms - basic Charms, required for every creature (Gold, Green, Crimson and Blue), and Charms that act as material objects, and are listed under the "Acquiring Ingredients" section. A material object. As Pikkupstix tells you, the entity you are Summoning needs to focus on something solid. This basically means you need something related to the creature you are Summoning, for example, you need a Raw Chicken to create a Dreadfowl Pouch (a Dreadfowl is a type of chicken). Fire Giants 86 A popular place to kill these is under the Baxtorian Falls, accessed during the Waterfall quest. They are aggressive, but will stop attacking you if you remain there for long enough. They drop mostly Gold Charms, but are known to drop Green, Blue and Crimson occasionally, too. Ice Giants 53 A good place to kill these is in the caves used during theKnight's Sword quest. There are also some tunnels on White Wolf Mountain, which can be accessed by mining the rockslide to the North, and going up the correct ladder can take you to a few Ice Giants. Ogres 53+ There are many different Ogres across RuneScape, but you should take note that the ogres in King Lathas' Training Camp do not drop Charms. Jogres 53 These are found on Karamja, on the east side of the southern island. Be sure to bring antipoison potions, as there are creatures that can poison you. Blue Dragons 111 These are also known to give good Charm drops, but be warned; take a look at the Dragon Hunting Guide before fighting these dangerous creatures. 40 Slayer Required These are found in the Fremennik Slayer Dungeon, but don't forget your Mirror Shield! 50 Slayer Required These beasts are found on the second floor of the Canifis Slayer Tower and the God Wars Dungeon. Other creatures have high drop rates of different Charms, but different creatures drop different charms, most more than one type. Moss Giants drop any of the Charms (except for Obsidian, Abyssal or any of the Void Knight Outpost Charms), so are useful if you are after a variety of them. Below is a list of the different Charms you can get, and examples of what creatures are likely to drop them. 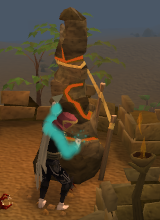 Note: An especially good source for these are Giant Rock Crabs, and can be found either on Waterbirth Island or the new Chaos Tunnels, found north-east of the Zamorak Mage, who is just north of Edgeville and across the Wilderness Ditch. 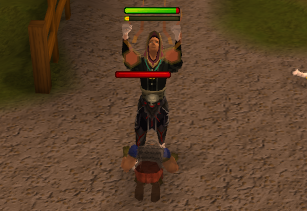 However, these are combat level 137, but can be attacked with magic from safespots. Aberrant Spectres - Level 96. Slayer level 60 and a Nose Peg required. Found in the Canifis Slayer Tower. Note: The other creatures in the Chaos Tunnels, as well as Giant Rock Crabs, are known to have high drop rates of Charms. Now that we've covered what you need to make the Summoning Pouches, it's time to learn how to actually make them. Firstly, gather the required materials for the Pouch. In this example, we will create Bunyip Pouch, which requires 1 Pouch (as all creatures do), 110 Spirit Shards, 1 Green Charm and 1 Raw Shark. If you have all of the ingredients, click "Infuse Bunyip Pouch", et voila, you have a Bunyip Pouch! Summoning Scrolls are used to activate your follower's special ability, and to make them, you need the Pouch of the creature that will be using the ability. We will use the example of a Bloated Leech. If you have a Bloated Leech Pouch, you can click "Infuse." You will receive 10 scrolls. Before learning how to Summon you should be aware of something: "Familiars" are creatures that are Summoned, and are temporary, whereas Pets are bought or captured and are permanent, unless you die with them in your pack or choose to dismiss them. Bringing a Familiar into RuneScape and keeping them there costs points, whereas getting a pet does not (see section on Pets for more information). To Summon a creature, you will need at least one Summoning Point and a Pouch containing the entity of whatever you want to Summon. Simply right-click a Pouch, and click "Summon [creature] Pouch." Some areas, mainly in parts of towns and always near an Obelisk, are "Summoning-Free." You will not be able to Summon anything in these areas, but you will be able to take them in with you. Pets, however, can be taken into or put down in these areas, except for certain Activities. Now that you have a Familiar, you will be able to access a new interface, found on the bottom-left of you inventory. Take BoB Items - if your Familiar is a forager and picks up something, or is a Beast of Burden and you have given it something, clicking this button takes any items from its inventory (you cannot take anything if your inventory is full). Dismiss Familiar - After your confirmation, this gets rid of your Familiar, and you will have to use another Pouch to bring another into being. This happens automatically after the timer runs out. Summoning Points Remaining - This conveniently shows you how many Summoning Points you have left. Familiar time remaining - Shows how long your follower has until it disappears. Special points remaining - This is similar to the special meter on weapons with special attacks, and goes down every time you use a Scroll. The amount goes down in different amounts, depending on what scroll you use; the bar recharges over time. Note: This is separate to your weapon's special bar, so if you use one, the other remains unaffected. Special ability - Clicking this, if you have scrolls in your inventory, will activate your Familiar's special attack. The number shows how many scrolls you have left. Renew familiar - Click this to renew your familiar, giving it more time to be summoned. A familiar is renewed for the same amount of time that it is orginally summoned for. For example, if you summoned a familiar with an initial timer of 10 minutes and renewed it, you would gain an extra 10 minutes. Using the renew option requires and consumes another pouch. Attack - This button will get your familiar to attack whatever monster you are attacking. You must be attacking the monster to do this (i.e. you cannot let your familiar go after a monster you are not attacking. When you Summon a Familiar, it will cost you a certain amount Summoning Points, depending on what Pouch you are using. 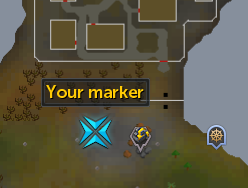 These are like Prayer Points, and can be recharged by right-clicking on an Obelisk and click "Renew-Points," or left-clicking on a Small obelisk. When Summoned, your creature will have a certain amount of minutes until it disappears, and your Summoning Points will be slowly drained if you have a Familiar out. Warnings will pop up in the chat box to let you know the timer is running out. The time your Familiar lasts depends on the creature you are Summoning (for example, with the Dreadfowl, it costs 1 point to Summon, and it lasts for 4 minutes before disappearing). Different Familiars have different abilities and different Scrolls. When you interact with your Familiar, they can perform an Ability, which will not drain your Summoning Points or Special Bar. Following the Dreadfowl example, if you talk to it and select "Farming boost," your Farming level will temporarily increase by one. Fights - The majority of Familiars have the ability to fight, but only in multicombat areas. They will only attack if you choose to attack something, and will retaliate if you have the auto-retaliate button switched on. Light enhancer - Some creatures (notably, bats) have the ability to make any light source with you brighter. Skill boost - Different Familiars can boost different skills. With some creatures, you must activate them by talking to them, but others, such as the Desert wyrm, can provide 'invisible' boosts, which remain active as long as they remain Summoned. Remote view - This allows you to see through the eyes of your Familiar, meaning that you can see things much further away. You can see in the different Cardinal directions (North, South, East and West) and directly above. Beast of burden - These can carry a certain number of items. Some Familiars can only hold specific items (such as the Abyssal parasite, which can only carry unnoted rune and pure essence). Forager - When having these Familiars Summoned, there is a chance that they will pick up items, specific to the creature. These are then put into the Familiar's 'inventory,' which you can only withdraw from. Healer - These regularly heal the Summoner for a few Life Points. If you choose to use a scroll, this will drain your Familiar's special bar by a few points, depending on what scroll you are using. To do so, click on the icon in the top left of the interface. Attack scrolls can only be used in multi-combat areas. For instance, Dreadfowl Strike can be activated in combat, and acts as a low-level missile spell. Each creature has a certain skill in which they help you, and this can be either combat or non-combat skills - these are called 'skill focuses.' In the table below, the time each Familiar remains out is shown, the combat level is shown if the Familiar fights, and their skill focus is written with any additional information in the column beside it. Aside from Abyssal parasite, lurker and titan, every slot can hold one item or stack of items (you cannot give them non-tradeable items). Some creatures have 'invisible' skill boosts. All this means is that the boost applies whilst they remain Summoned, rather than having to interact with them to activate it. 57 Spirit kyatt 49 93 Attack Hunter boost (5 - invisible). If called or Summoned straight into combat, it's first attack can be 3 times as powerful. Can teleport you to the Piscatoris Hunter area. Some of the secondary ingredients are harder to acquire than others, and below is a list of where to get them. Remember that the Grand Exchange can be your best friend when leveling Summoning, if you don't mind spending extra to get the ingredients. These act as any other material object, despite being called charms. All of these Charms are non-stackable. Obsidian Charms - only dropped by monsters in TzHaar. Abyssal Charms - only dropped by creatures from The Abyss. Ravager, Shifter, Spinner and Torcher Charms - bought from the Void Knights at Void Knight Outpost for the cost of two Pest Control points each. Talon Beast Charm - found during Temple Trekking and Burgh de Rott Ramble Activities. 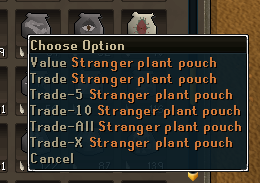 Bagged Plant Bought from the Garden Supplier in Falador park. There are three variations of the plant, costing 1k, 5k and 10k respectively. Bronze Claws Player Smithed (must have completed Death Plateau quest) or bought from the Lost and Found store in the Rogue's Den. Carved Turnip Carved from an Evil turnip with a chisel, which can be grown using an Evil turnip seed in any allotment patch. Must have level 42 Farming to grow. Chinchompa Caught using the Hunter skill with a box trap, level 53 required. They are found at the Piscatoris Hunter area. Cockatrice Egg Drop from Cockatrice (level 37), level 25 Slayer required. Don't forget to bring your Mirror Shield! Dagannoth Hide Dropped by the Dagannoths (combat level 90) and the Dagannoth kings (level 303) on Waterbirth Island. Fishbowl Can be made from molten glass at level 43 Crafting. Goat's Horn Dust Made by grinding desert goat's horn, which is a 100% drop from Goats and Billy goats in the Kharidian Desert. It is also dropped by Locust riders and Scarab magi, which you can find during and after the completion of the Contact! Quest. Graahk, Kyatt and Larupia Fur Found by successfully trapping a graahk, kyatt or larupia with a pitfall trap. For more information on pitfall trapping, click here. Granite (550g) Mined in the Quarry, which is found in the Desert (level 45 Mining required). The Quarry is used during the Enakhra's Lament Quest. Honeycomb Taken from the beehives in Catherby, must have Insect Repellent in your inventory (found in a house north of the Catherby bank). Polar Kebbit Fur Dropped by Polar kebbits, which can be caught with the Hunter skill (level 1 required). 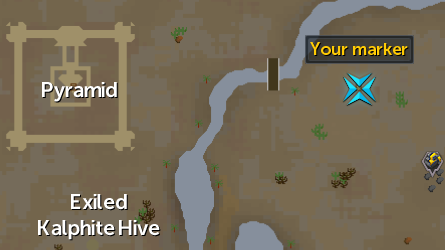 Potato Cactus Respawns in areas of the Kalphite Lair, be warned of the level 85 Kalphite Soldiers (poison frequently); it is not recommended to collect them in the Kalphite Queen area, as the chances are, you will be killed! Proboscis Found by killing mosquito swarms during the Tai Bwo Wannai cleanup Activity. Raw Bird Meat Obtained by successfully catching any bird with the Hunter skill. Can also be bought from the store in Oo'glog for 17gp. 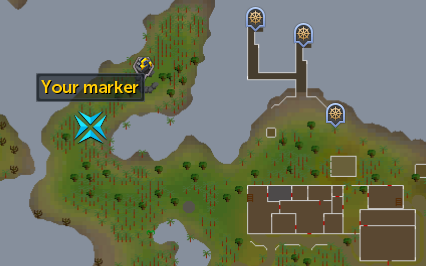 Raw Thin Snail Found by killing Snails in Mort Myre swamp; be sure to bring a Silver sickle(b) to avoid the swamp decay effect. Must have started the Nature Spirit quest. It can also be bought from the general store in Burgh de Rott, so long as you have repaired and supplied it, during the In Aid of the Myreque Quest. Red Flowers Bought from the Flower girl in Miscellania, or grown from Mithril seeds (bought from the Legend's Guild for 300gp each, given as a reward from the Waterfall Quest). Ruby Harvest Caught using the Hunter skill with a butterfly net, level 15 required. For more information on using a butterfly net, click here. 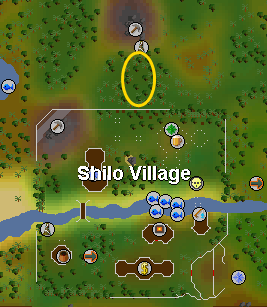 Snake Hide Drop from Bush snakes during the Tai Bwo Wannai Cleanup Activity,, and Snakes found on Mos Le'Harmless (both combat level 35, poisonous). 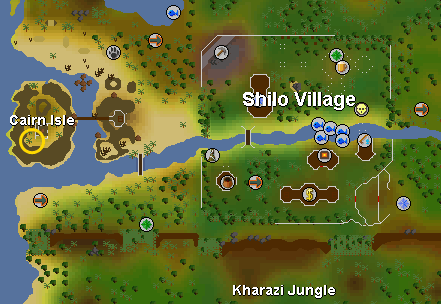 Both give Snake Hide as a 100% drop, but the snakes on Mos Le'Harmless are much easier to find, and so are a more efficient way of gathering hides.During the Temple Trekking Activity, you can obtain hides from snakes during the Snake Event by using a knife on their corpses after killing them. Spider Carcass Found by killing Jungle spiders (level 44) on Karamja; be careful, they can poison, although rarely. Swamp Lizard Caught with the Hunter skill, level 29 and a net trap required. For more information about net trapping, click here. Swamp Toad There are 3 respawns at the southern end of Taverley, near the lake, and even more can be found in the north-westerly swamp of the Tree Gnome Stronghold. 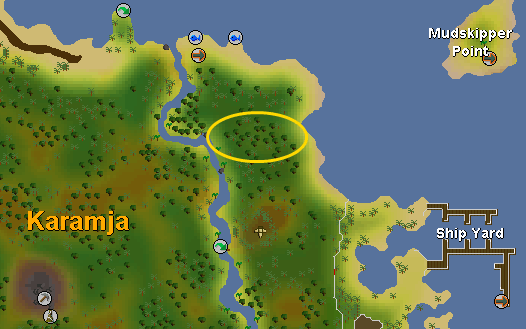 Also dropped by Tortoises to the north of the swamp and in the Battlefield of Khazard, to the north of the Tree Gnome Village and south of Ardougne. 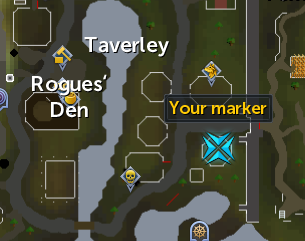 Tortoise Shell Sometimes dropped by the tortoises mentioned above, and also by Warped tortoises (level 96, requires 56 Slayer and a Crystal chime to kill) in the sewers that can be accessed during and after the Path of Glouphrie Quest. Unicorn Horn 100% Drop from Unicorns and Black unicorns. Vampire Dust 100% Drop from Vampires, found to the east of Canifis. 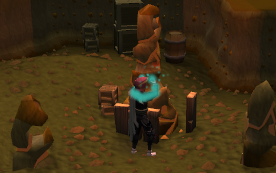 Water Orb Made by charging an Unpowered orb (made with molten glass, level 46 Crafting required) at the Water Obelisk. 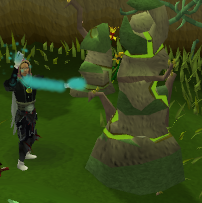 Willow Branch Cut from player-grown Willow tree using secateurs (level 30 Farming required). Yak Hide 100% Drop from the level 22 Yaks on Neitiznot. It is advised to take into account the cost of the material item required before using this table to work out the expense of training. Charms are also a big factor when deciding upon a method of training; some Charms are much harder to come across than others. If you are fed up of wandering round, mindlessly killing anything in your path, then you may want to get a pet. Then you can continue said killing, except that you will have a companion to keep you company! Pets do not require any Summoning Points to care for them, just a little food and attention. This is located South of the quest start point for the Wolf Whistle quest. 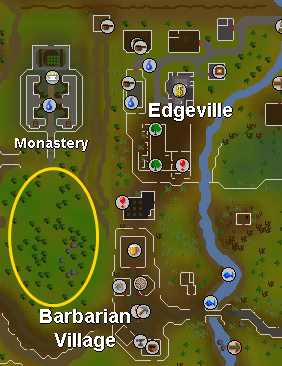 The Yanille pet store is between the Hunter store and the Wizards' Guild, near the center of the town. Nuts: Used to feed squirrels, and also helps when catching them by using them with a Net trap (level 60 Summoning and 27 Hunter required). Flies: Used to feed Baby Geckos, and helps when catching them with a Box trap (level 10 Summoning and 27 Hunter). Also feeds Chameleons. Beetle Bits: Used to feed Adult Geckos. The pet store owner, when spoken too, will also sell you a dog of your choice for 500gp. When you have got your pet, you can choose to "drop" it. This will not get rid of it, but allows your pet to follow you. 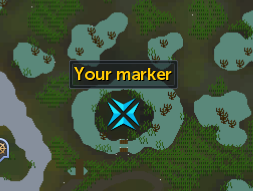 You can access the Pet Interface the same way as you would the Familiar Interface, by clicking the icon in the bottom left hand corner; they are quite similar. Call Pet - Makes your pet appear beside you. Dismiss Pet - If you confirm, your pet will disappear and you will not be able to get the same one again. You will have to get another and start caring for it from the beginning! Pet Growth Percentage - Shows how close your pet is to growing to its next stage. For most pets, at 100% it becomes fully grown, but several pets have more than one stage. For example, when you hatch a Guthix Raptor, it will start off as a chick, grow into a bird, and then become a fully grown Raptor. Pets only grow when you are logged in. 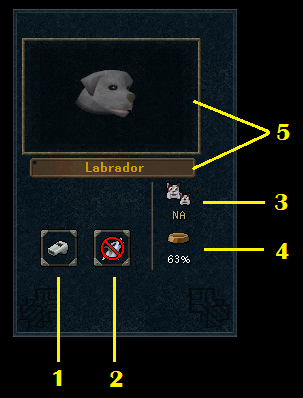 If your pet is fully grown, the icon will show "NA" (as seen in the picture). Pet Hunger - You must feed your pet in order for it to survive! The higher this percentage, the hungrier your pet is. Different pets eat different food, as shown in the table below. The pictures shown are just one color of each Pet - some of them can have different variations (colors). To obtain a different color dog, you would have to dismiss your current one and purchase a new one. 4 Creeping Hand Leather Gloves Purchased from Soul Wars for 5 Zeal. 4 Baby Basilisk Eye of Newt Purchased from Soul Wars for 40 Zeal. 4 Baby Kurask Bones Purchased from Soul Wars for 70 Zeal. 4 Abyssal Minion Ashes Purchased from Soul Wars for 85 Zeal. 10 Gecko Eats flies as a baby, beetle bits as an adult Hunted on the north-eastern side of Karamja (near the shipyard), level 27 and a box trap required. 10 Platypus Raw fish/fishing bait (ground in baby form) Hunted with a box trap after completing the As a First Resort Quest. You must be holding burning Lavender to attract them. 30 Penguin Raw fish Egg is obtained from the Penguin minder in the Ardougne Zoo. 40 Giant crab Raw fish Obtained from Nung in the Mogre Encampment, found during the Recipe for Disaster Quest. You must have a Crunchy claw token, which is a drop from Mogres. 50 Raven Ground fishing bait as a chick, fishing bait as an adult Egg found in Bird's nests from Woodcutting. 60 Squirrel Eats nuts Hunted to the west of Barbarian Village, level 29 Hunter and a net trap baited with Nuts required. 70 Guthix raptor Ground fishing bait as a chick, fishing bait when older Egg found in Bird's nests from Woodcutting. 70 Saradomin owl Ground fishing bait as a chick, fishing bait when older Egg found in Bird's nests from Woodcutting. 70 Zamorak hawk Ground fishing bait as a chick, fishing bait when older Egg found in Bird's nests from Woodcutting. 80 Raccoon Raw meat and fish Hunted to the east of Barbarian Village, level 27 Hunter and a box trap required. 85 Vulture Ground fishing bait as a chick, fishing bait as an adult Egg obtained by killing Vultures in the Desert. 90 Chameleon Eats flies Egg found on Cairn Isle, near Shilo Village. 95 Monkey Eats bananas Hunted on Karamja, level 27 Hunter and a box trap baited with a banana required. 99 Baby dragon Eats lots of raw meat, fish or chicken Egg dropped by the various Dragons throughout RuneScape. It is possible to get different colored Dragons, depending on what you are killing. Even though your pet may be nothing more than pixels and coding, it still has to be fed! Every pet gets hungry in its younger form, and each has its own food requirements. Some Pets, such as adult cats (from the Gertrude's Cat Quest (no Summoning level required) do not need to be fed when they are older. By looking at your follower's Hunger Percentage, you can see how hungry it is. You shouldn't let your pet get too hungry, as if it begins to starve (at 100% hunger) it will run away, and you will have to acquire a new one. Since every pet needs to be fed a certain type of food, you should probably find out what to feed your Pet before you get one. The table below also shows where to find your pet (click the thumbnails for more detail). The vast majority of Pets have two forms (baby and adult) and take 10 hours in game to raise, but the 'God Birds' (Zamorak hawk, Guthix Raptor and Saradomin Owl) have three forms (chick, bird and hawk/raptor/owl) and so they take 20 hours to raise in game. Note: You can only have one follower out at a time, and the number of pets you can have increases with your Summoning level. This starts at 1 pet at level 4, and with every 10 Summoning levels, you can raise one more pet. 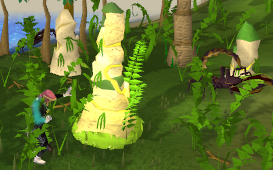 Note on Eggs: Eggs are a random yield from Bird's nests obtained from Woodcutting. They must be found when cutting trees or with the Managing Miscellania Activity (when collecting maple logs, you may receive a nest), rather than by exchanging Mole skin / claws with Wyson, if you wish to get one of the three colored eggs or a Raven egg. 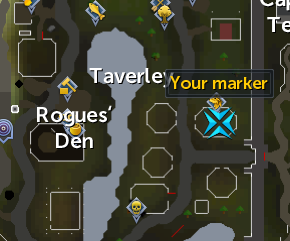 All eggs must be incubated in the Incubator at either the Yanille or Taverley Pet Stores. There are various types of headgear that you can wear at different Summoning levels. Three of these are specifically designed for this purpose (Antlers, Lizard skull and Feathered headdresses), and the rest can be converted (and unconverted) by Pikkupstix. When converted, they cannot be traded, and have the ability to hold scrolls, and they will also look a little lighter than the original helmet. Each of these can store a different number of scrolls, and activate when you are in combat and have the Familiar Summoned that matches said scrolls. Summoning level 10 required, can store up to 40 scrolls. Bought from Summoning Stores for 100gp. Summoning level 30 required, can store up to 65 scrolls. Bought from Summoning Stores for 200gp. Summoning level 50 required, can store up to 150 scrolls. Crafted from a Coif and 20 colored feathers (i.e. Red, Brown, Stripy; obtained from bird snaring with the Hunter skill), level 79 Crafting Required. Summoning potions can be used to restore a percentage of your Summoning points with each dose, like a Prayer potion (7-31 points, depending on your level). You can make them by adding a clean spirit weed and a Cockatrice egg to a vial of water. When you are ten levels above the required Summoning level to Summon, buy, or catch your familiar/pet, you will be able to understand them, but you will need a M'Speak Amulet to understand monkeys (obtained during the Monkey Madness Quest). Therefore you will never be able to understand creatures that require a Summoning level of 90+ (you cannot use the Summoning boost that comes with the skill cape to talk to them, either), and this does not apply to the Abyssal creatures, who will always talk a garbled language.